Having won four of five games, including a 27-point thrashing of Crofton in the regular-season finale, the Boone Central/Newman Grove Cardinals felt poised for a postseason run and possible third straight trip to the state basketball tournament. 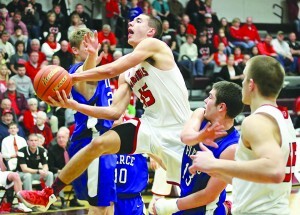 Mid-State Conference rival Pierce had other ideas. With a dazzling display of offensive execution and shooting prowess – as well as their trademark, harassing, man-to-man defense – the Bluejays raced to early leads in a C1-8 Sub-District contest Tuesday at Norfolk and ended BC/NG’s season with a 20-5 blitz that capped a somewhat-shocking 65-39 victory. Certainly different than the Cardinals’ 60-54 overtime victory over Pierce in December. Pierce (17-7), with just one starter as tall as 6-foot-1, appeared to be at a disadvantage, at least in the paint, to a Cardinal line-up featuring two 6-foot-6 starters and none under 6-foot-3. The Jays battled Boone Central/Newman Grove evenly on the boards, however, and used their quickness to get open shots, while forcing BC/NG out of its offensive comfort zone. That led to a decisive shooting disparity. Pierce sank as many three-point field goals (9) as two-pointers and went 20-of-22 at the free throw line. Meanwhile, BC/NG struggled to 33 percent overall accuracy, including 3-of-12 from behind the arc, and made just 8-of-17 foul shots.